Shaun made a valid point last night that I should probably make the children the same thing for lunch instead of two different ones. The problem lies in the fact that Ben wanted what Faith had on Friday and Faith wanted anything but Friday's lunch. So, for an extra few minutes of my time, they were both happy. Faith had a turkey and cheese quesadilla, carrot sticks, some kind of Teddy Graham type of cookie, some vanilla yogurt (HK container) and canteloupe. She ate it all but the yogurt and poitned out that I forgot the spoon. Oops. Hi there, I recently found your blog and love your ideas! I'm curious about how you pack things like quesadillas & corndog muffins as far as keeping the food safe goes... do you include cold packs and have the kids eat them cold or just go for it and send them at room temp? 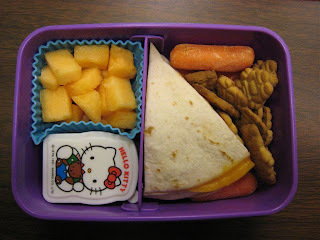 I've got a kindergartener and it's our first year sending lunch, so lots of questions! Thanks! Ohhhh good idea Quessadillas, do you heat it up in the morning and then send it? Also on the muffins (MY KIDS LOVE THE CHEESEBURGER ONESS) do you freeze them and pop one in the microwave before school? Is there a recipe somewhere on your fantastic blog for the corndog muffin?